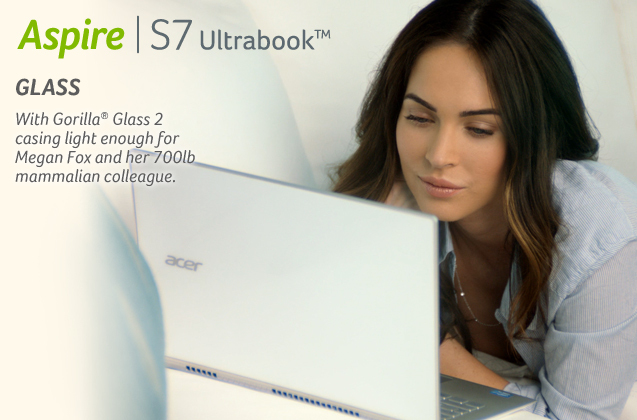 Acer Computer’s Megan Fox Marketing Campaign is a Big Question Mark – StratGo Marketing. Plug-in marketing department services. What is Acer doing with its new marketing and advertising push? If the video posted on Acer’s YouTube channel is indicative of the branding the company is hoping to build, my response is: Huh? Sorry, I don’t get it. Yes, the video is interesting to watch, but how does it help build and define the Acer brand? This lifestyle technology positioning with scientist Fox is a stretch. It could work from a brand awareness standpoint, but that’s likely to be short-lived. However, the TV ads are running globally in local language versions (U.S., China, the U.K., Russia, Germany and France, per Ms. Dou), so it’s possible there may be more traction overseas than here in the US (playing off Fox’s and Transformers’ overseas popularity?). I do like Acer’s product benefit ad, which is contemporary, well-done and effective in explaining the new computer. Maybe this type of hard sell coupled with the awareness-generation of the Fox spots will be a winning combination. But still, talking dolphins? Come on. The Fox campaign comes on the heels of a similar effort (also Huh?) featuring cupcake-lover Kiefer Sutherland on behalf of the Aspire S5 Ultrabook. Give Acer credit for consistency at least. Watch the video here. Look, positioning and building a brand is hard work, especially targeting computers to the consumer market; and I applaud Acer for trying to take the brand-building road. But the Fox campaign seems to be focusing on short-term awareness, which is not the same thing as building a relevant, meaningful and lasting brand relationship platform with customers. I have to say the odds are stacked against Acer. Sorry, Megan Fox talking to dolphins is not a reason to buy an Acer computer. Maybe I’m missing the boat, but there should be more than that to an Acer brand-building campaign, especially when reallocating and investing limited company financial resources. Hi Harvey, I have exactly the opposite response. The Megan Fox ad is great, the product features ad is a dud. These two ads exemplify what most computer brands have been doing right or wrong for oh, decades. First, the product features ad. One fan pulls cool air in, the other warm air out? Are you kidding me? The number of people that care how their laptop is cooled is exactly zero. The keyboard adjusts its backlight … don’t all laptops do that since the Macbook added that about 8 years ago or something? That’s a checklist feature. Gorilla Glass? Uh, I’m not planning to drop my laptop, but doesn’t everyone use that now? The bottom line is that nothing in that ad differentiated Acer. The Megan Fox ad on the other hand had an impact. Megan Fox has a clear brand: hot. Very hot. Does she have a brain? Who the hell knows? Acer, however, knows that all of us are more than we seem. We just need a hand unleashing that passion. Megan Fox just needed an awesome little laptop to show the world she was a Nobel-class marine scientist. What does the world not know about you that might be revealed with the right weapon in your hot little hands? It positions Acer as the brand for those to aspire, not coincidentally their model name. If Apple has shown us anything it’s that we’re in a post-specs technology world. Who cares what the processor speed is? Nobody. Does thing help me do something I want or need to do? Does it help me make a statement about who I am? Does it fit my self-image? Those have always been branding questions and Acer has created an ad that directly addresses those questions. Thanks for your comment – good points. I agree that “help me do something I want or need to do” is a critical idea that has to get communicated via the marketing. In the Apple case, though, it was the technology that made it happen (differentiated technology in the marketplace), and Apple was able to demonstrate how its technololgy could make your life better without getting into a technical data sheet. I don’t see that with the Fox ad. Maybe the campaign will drive more shoppers to the store asking about Acer, and if there is a good price/value relationship, maybe it will generate incremental sales. At the end of the day, though, there has to be some reason to buy Acer instead of a competing brand. Fox is not the reason for me, but I doubt I’m in Acer’s target market, so maybe you’re on to something. Let’s see what happens. Loved the article and definitely agree with Harvey, the Megan Fox ad is terrible in my opinion. Jeff, its not the Acer laptop that turns her into a “nobel-class marine scientist” it was…the team of marine scientists ..and to me this ad makes her look silly too, showing her as a dreamy girl who wants to talk to dolphins, one could almost say sexist. And Jeff , I also thoroughly disagree about the spec add, I though it was good and to me, a 22 year old male, it is important for my laptop not to overheat, for it to be touch screen and have a resistant screen. Furthermore the spec ad subtly shows the Acer laptop being used for anything from engineering design, to home use , to DJ-ing, and that is good branding: Acer= a powerfull machine for all purposes is the message i got. I’m sorry, were there also computers in the Megan Fox ad? Wow! Actually, agree with you Harvey. Doesn’t really say anything about the uniqueness of Acer and apparently gambling on breakthru/hipness quotient to carry the day. Megan Fox represents very few things to a lot of people; but I bet stretching the limits of computing capability is not one of them. Well, if you don’t have anything to say, get Megan.